Although Camp Young Judaea-Texas in Wimberley, Texas, provides a technology-free environment for campers, the operation can’t run smoothly without modern technology. In many ways, the camp has led the pack in figuring out how to harness technology to improve the safety, quality, and programs for campers and their families. The first transition came after Hurricane Ike hit Houston in 2008. At that time, my staff and I thought we were really advanced by hosting our own exchange server, but we soon discovered there was no email without power or the Internet. Soon after, we switched to a hosted solution and currently use Google Apps for mail service. (Tip: some camps might be eligible to receive free versions.) Once we handled that transition, we realized the money formerly used for an Information Technology person could be used on additional upgrades and equipment. We had to prioritize the biggest challenges to see if a solution could be implemented on our own or if we had to find partners to provide reliable technology. For example, we were always bothered that there was no accurate way to track the temperature of the cooling units around the camp. Although a daily handwritten log was to be kept, admittedly that task rarely was completed. Finally, we found a product that sends an email and a text when a unit is acting up. Oftentimes, a door is left open, which makes the temperature rise, but on a few occasions, we’ve been able to catch a leak or discover equipment that is not running at the proper temperature and fix it before anything spoils. The state inspectors were thrilled! Then we moved onto the phone lines. Although this turned out to be a real undertaking, it also yielded a significant cost savings. Is there enough bandwidth to support phone calls and also upload photos and videos for parents’ enjoyment? What else is connected to the phone lines that we are not considering (e.g., fire panels, paging system, front gate, and fax)? After answering these questions, we realized there was no cost-effective way to achieve what we were trying to do, but we never stopped dreaming. A few years ago, we bought a couple of IP phones and connected them to the network; while we only used them for outgoing calls, we found that, although we have “slow” Internet at the camp, we were still able to make phone calls with reasonable quality. Once a year, we contacted our vendors in order to solve outlying issues. There was progress as more providers had better integration with a legacy system. We also realized it would be very expensive to achieve everything and we should spread the cost over a few years. Last year, we finally found a solution we could work with. We priced the system out and discovered we could afford it if we were able to install and implement it on our own. We picked a product with effective manuals and how-to guides to assist with the installation. The system was Windows-based, and although it moves away from “the cloud,” it answered all of the questions we had 4 years ago. We knew how to work with Windows, and we could even test it on my computer using a free version. Success! After about a week of testing, we were able to make and receive phone calls. The system was then implemented at our entire office. 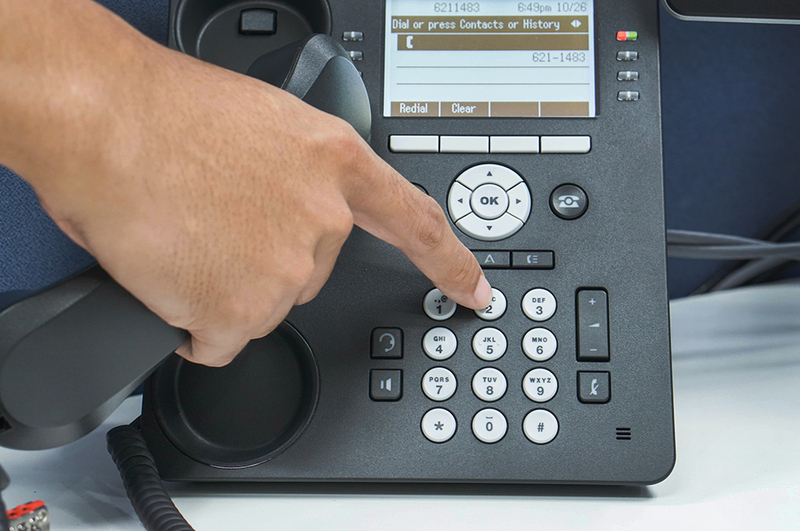 The IP phones we had did not play nice with the new system; it would cost a lot in support and just wasn’t worth it. There was no reason to get an expansive server. We bought a business-grade PC with a 3-year warranty instead. After testing one phone of a different brand, we ordered seven additional phones to cover the Houston office. We bought a license for the software for eight simultaneous calls. Buying new lines (DID) was cheap and easy; we have ported our main office number (which can take a couple of weeks). We set up a “disaster-recovery option,” so if the Internet goes down, a cell phone of one of our office staff members will ring. Call logic was important in designing the appropriate system. For example, when a client calls, should the call ring the entire office or just the receptionist, and after three rings move to the next person? Or should the call go straight to an automated receptionist? We discovered we could do it all. After mastering the system at the office, we decided to repeat the steps at camp. This more complicated procedure required additional research. The goal was to keep only two lines: a fax and a backup line. We contacted the fire-alarm company to move our panels to Internet panels. We bought a device that connected an analog line to our VoIP system. We identified eight extensions that didn’t have an Internet jack and bought another convertor for those. We bought additional phones—but cheaper ones this time—because they are only used a few months out of the year. We connected the front gate to one of the converters so clients and vendors can still push the call button and the phone will ring at the desired extension; during the off-season, it rings in the corporate office as well. We identified the key equipment that, in case of power and Internet outage, can still run, using a rack-mounted battery and a POE adapter. We tested different scenarios of outages to make sure we get at least 30 minutes before the first device runs out of power. We assumed that 30 minutes is enough time to call the right agencies, bring cell phones, and notify parents that there is a temporary outage. The result? We slashed the phone bill from around $650 a month to about $125. Obviously, there are costs for equipment, servers, software, and phones. Because we were able to do the bulk of the job ourselves, we expect a return on investment in about 2 years. We also now have a more advanced system. 2. It might be easier to buy new network equipment if it means additional manuals and FAQs. 3. To make the configuration easy, put all of the phones and equipment on the same network. Bar Twito is the Director of Operations at Camp Young Judaea-Texas in Wimberley, Texas. Reach him at bar@cyjtexas.org.